Every year popular web comic Penny-Arcade hosts a charity to raise money for children's hospitals. 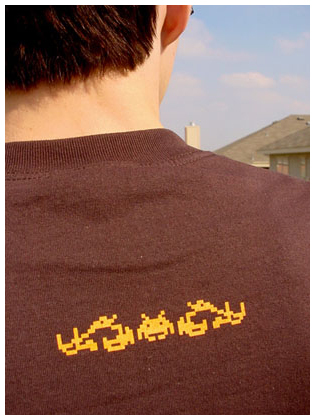 In 2005 my roommate Eric Koch and I had the idea for this t-shirt. At the time Penny-Arcade was the target of anti video game lawyer Jack Thompson. He was writing letters to everyone he could to get their website taken off line because of their users comments about him. 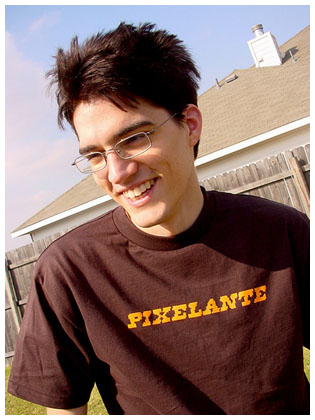 He coined the term Pixelante to refer to these Penny-Arcade users who were making fun of him. We thought it was hilarious and decided to make the shirt over lunch one Friday afternoon. About 48 hours later, thanks to a post on Penny-Arcade, we had sold over $6000 worth of shirts that hadn't been printed yet. Kevin our printer at Foundry press did an amazing job to produce the shirts within a week. It was a bit of a logistics nightmare to fulfill all of the orders, but we turned our living room into an assembly line and got it done in a few nights. We shipped over 300 shirts all over the world and were able to donate $2000 in profit to the children's hospitals.